FlamesRising.com contributor Eric Pollarine blogs about horror music and horror artists in this colorful post about his top ten Halloween songs, albums and soundtracks. It’s time for Halloween again, that most special of holidays for nerds, RPG folks, fan boys, Goth kids, and freak shows such as us, where we are able to come out come out from wherever we normally hide and celebrate openly, without fear of persecution, our collective weirdness. From the food court in the mall to the back room of the comic shop, from our mother’s basement to the diner down the street, no-not that one, the other one down the street. Ah yes, even the kindly old couple down the street, who always, always, always offers you those horrible, stale, melted root beer barrels-they get so sticky and gross after so many years at the bottom of the “candy drawer,” allow themselves to be caught up in the fever pitch of Ghosts and Goblins, of blood and guts. But let me say this, I am not going to go into some historical or factual detail here, nope this article is all about music and in particular the best music to listen to during the Halloween season, so if you are looking for the nitty gritty down and dirty details of Celtic rites or druidic customs, then look somewhere else. This is about music that is spooky, that amps you up for the day of all days and night of all nights. The music that lets you know what time of the year it is, that screams bloody murder in your ear and leaves you feeling both tired and sick, bloated on those root beer barrels and wanting more. So in the fashion of desert island picks and “High Fidelity” style top five lists, except I am doing ten because I can and because there are just too many different artists/songs/compilations to choose from, here are some of the pieces of horror or horror inspired musics that I personally think should be on your Mp3 player for Samhain. This horror artist is quite possibly the most respected Halloween/ ambient/haunted house/ classical musical group in all the world. They literally invented the backing track to almost every major big budget haunted house from Bush Gardens to Six Flags, From Cedar Point to King’s Island. 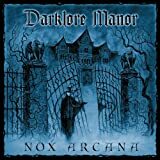 And Darklore Manor is their first and will most likely go down as one of their best. Imagine walking through an old Victorian Mansion, which of course, as always, is reported to be haunted. Or here let me put it to you another way- imagine Dark Shadows, the television show, original 60’s campy one, now the screen shot of the old mansion, yep that’s what this sounds like. Of course if you are looking for actual music, with lyrics and hooks, catchy tunes-you won’t find them here. That’s not the bands thing. There thing is to make deep, melodic, haunting classical/ambient works based on themes or literature, and guess what it’s all dark and creepy. You can visit them at their website www.noxarcana.com for info, bio, music and more. Philip Glass is one of the most influential and important composers/musicians in the history of the twentieth century. Turning classical music back into something that was not only enjoyable but also avant garde, his inspirations are as varied as anything could ever be and include punk, ambient, noise, electronic music as well as Brahms and Beethoven. In 1998, Universal Studios who currently own the rights to all the famous monsters, asked Mr. Glass to add a score to the original 1931 Dracula movie starring Bela Lugosi. Of course, Glass, having already done some fantastic mood pieces based on Franz Kafka jumped at the chance to complete this time honored film. Using the well-known Kronos quartet, to symbolize the setting of Dracula, the 19th century, Mr. Glass offers us a haunting, romantic, often dreamy and unnerving soundtrack a must for any Halloween party. While the whole soundtrack will make you shiver, I’m going to talk about Surfin Dead by The Cramps. There have been few bands that have caught the spirit of punk rock, there have been lots and lots and lots of bands that have tried, The Cramps on the other hand were as raw, real, and yet glamorous as punk should be. Basically creating the very sound of Psychobilly, an infusion of pun, classic rockabilly and surf music along with lyrics which are on the darker side, The Cramps stand as a testament to the D.I.Y. creative aspect to the most original music genre ever. I could have reviewed their whole catalog, but instead I chose the song they were asked to contribute to one of the worst zombie movies of all time, Return of the Living Dead. No, Surfin Dead is not a great song, but it is a worthwhile find if you are throwing a zombie walk. I absolutely hate this song; it’s the catch-all stereotypical melody and beat that all bad mall Goth kids walk to in their heads. It’s what they play during any spoof of the subculture, and by they I mean the mass media, it’s, well, it’s a terrible song. But if I didn’t include it here then someone would have said something about it. Bauhaus was such a talented band, Peter Murphy and Daniel Ash being the main creative force behind the name, they have so many, many, many good songs that it seems like a shame for me to fixate on this one. But let it not be said I glossed over a perfectly good Halloween pick for personal reasons. Bela Lugosi’s Dead, clocking in at a little over 9 minutes, is the original Goth tour de force, with Guitar harmonics and string plucks, with the baritone bass signature post punk grumble, with the constant, almost rockabilly-esque back beat, it is no wonder as to why this is the grandfather of all Goth rock/punk songs. And with the lyrics such as “The bats have left the bell tower,” and other allusions to the undead, it is a true Halloween epic masterpiece. The song is also featured in the 80’s vampire film, starring David Bowie, The Hunger. Trent gets a lot of flack, a lot. For starters, because he’s Trent Reznor, a moody introspective angst-ridden, some would say still infatuated with pre pubescent insecurities, musician who enjoys the control of working either by himself or with a small group of collaborators. Other reasons why Trent gets flack-because he moved out of Cleveland, effectively stalling the city’s reputation for ground breaking music in the mid 90’s, for ripping off ministry and other industrial bands sound and making it more pop friendly, all the way to simply sucking. But of course none of those issues are really the case. Nope, the case is simple-Trent Reznor is a wonderful, creative, musical personality who has been high and low and continues to deliver fantastic pieces and creative approaches to everything in the business of music. Ghosts I-IV is a fantastic, dreamy, dark melodic yet ambient experiment-released under creative commons licensing- which would provide a fantastic backing track to any game of Vampire: the Masquerade. Or even Shadowrun or just plain old creepy outside your haunted house music. Since its release it has made my spine tingle and my head spin. It is definitely going to get played on my doorstep this year! Man, oh man- do I not like Ska music. Ok that isn’t entirely true, I like some Ska music, like Hepcat and some Ska Punk stuff like Operation Ivy, a band that should have been bigger than Green Day and Rancid put together, but for the most part-I hate Ska. However, The Specials, and more succinctly their single Ghost Town, pretty much makes you feel like you’re in a haunted spy movie. SO, it gets inclusion on this list for being not only an awesome Halloween-ish song, but for also making me not kill people in skinny ties and close cropped suits. From the arabesque scales they use to the subtle synthesizers and basic Ska guitar strums this song has atmosphere to last all night. Vincent Price rapping, zombies, werewolves and Michael Jackson. What more needs to be said? Released on CD 1995. Collects a best of from 1977-1983. I have saved the absolute best for last and obviously the best song for Halloween, is in fact Halloween or the 9th track on this particular compilation. But in reality, every single song done by both the original Misfits line up, as well as the American Psycho release, along with Danzig’s other work, including Samhain, obviously just for the fact that it’s named after the original Celtic name for the night of the dead, and even Danzig’s solo work has Halloween written all over it. I could write another 1500 words just on this particular pick, but won’t-as time for this articles submission and word count is running out. Look, there’s going to be many of you who will most likely look at this list and think, well where’s “Monster Mash” or blah, blah, blah-but this isn’t about that sort of stuff this is about the music that makes you pumped, amped and ready for the Halloween season. There is without a doubt in my mind, no other collection of songs which will do so, than the entire The Misfits and Samhain and Danzig catalogue. From the opening tracks of the original Misfits album Static Age, Return of the Fly, Static Age, Teenagers From Mars, We Are 138-inspired by the often forgotten about George Lucas film THX-1138- to the fifties throw back rock tracks such as Last Caress and Hybrid Moments, both songs where Danzig sounds eerily like Elvis Presley, establishing him as one of the greatest rock singers of all time. Then you can jump to other releases by the band such as Walk Among Us, which features songs like Night of the Living Dead, Astro Zombies and Vampira-up to and including the 1997, post Danzig release of American Psycho, with it’s professional polish and sheen on songs like Mars Attacks, The Hunger, Walk Among Us and the awesome Hell Night. No, there isn’t one song released by any of these entities that doesn’t scream Halloween, at the top of its lungs, out into the grey dawn of the world and to the flame-colored treetops of fall. I can not stress how simply exhilarating it is to listen to these songs, even still to this day, and feel that same sense of elation and joy for the calendar turning over to October. That’s the list and this is the end and I don’t want you thinking this wasn’t a hard assignment. I had to leave out so many awesome songs and artists that I was thinking about doing a top 20 or even thirty, but I think, that if you really look at the songs/artists that I chose you’ll see the threading on the costume. So, if you don’t have these songs or albums already then go out and download them, and get ready to carve up pumpkins and body parts –but just stay away from that kindly old couple-those root beer barrels might break your teeth. Good to see a Nox Arcana song though.